Sherman’s troops burned it the first time. Now a serial arsonist threatens a small South Carolina town and private investigator Quint Mitchell is caught in the backdraft. When Quint follows the “Heartthrob Bandit” to the hamlet of Allendale, he finds himself in the crossfire of an ugly cultural war between an ultraconservative minister and the scientist who may have discovered proof of the oldest humans ever found in North America. As the heat grows more intense, arson turns to murder, and Quint is embroiled in a growing firestorm that threatens to destroy Allendale for the second time. A media frenzy surrounding the clash of faith and science whips emotions to a fiery crescendo. With time running out, Quint is the only man standing between a vicious killer with nothing to lose and his plan to bring down the furies on Allendale and Quint. 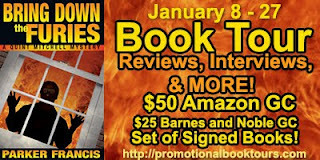 Purchase Bring Down The Furies on Amazon. I received a copy of this novel in exchange for my honest review. I’ve always loved a good mystery, as I read I’m always busy working my mind trying to figure out who did it. Usually, halfway through, I’m bored with it because I’ve solved the case. This was the first mystery novel in a very long time that kept me guessing to the very end. It has a great cast of characters with quite a variety of personalities. Quint Mitchell is a great PI and travels to South Carolina on one case and ends up in the middle of two. This book reminds me of Nelson DeMille’s John Corey Series. Bring Down The Furies is a must read for any mystery lover. Parker Francis is the pen name of author Victor DiGenti. As Parker, I write gritty, fast-paced mysteries filled with murder, violence and laced with humor. The first in my Quint Mitchell Mystery series was MATANZAS BAY, an award-winning adventure set in the nation's oldest city. The second in the series, BRING DOWN THE FURIES, takes PI Mitchell to Allendale, SC where he becomes embroiled in an ugly cultural war and comes face to face with a serial arsonist. In my first life I worked for the Public Broadcasting stations in NE Florida with diverse duties that included public affairs producer, director, reporter, fundraiser and producer of the Jacksonville Jazz Festival. My first three books were written using my real name. They were adventure/fantasies with a feline protagonist. The WINDRUSHER trilogy won multiple awards and attracted readers of all ages. Parker (aka Vic) lives in NE Florida with his wife and their rescued cats who tolerate them as long as their bowls are filled and litter boxes emptied. I entered - sounds like a great book.